I took a screenshot of the file with just its background layer in 1.6 and did the same in 1.7. I then overlaid them and applied a Difference Blend Mode. As the entire canvas is black, this means there is no difference in tone (at least on my end). I've attached the file for you to look at. So either a setting is different on your machine or you are working on different files. I did initially think that because you've got one in Light UI and one in Dark UI, we were being tricked (like in the famous Checker Shadow illusion image). Even the Histogram is the same for me. Other than that, I'm really not sure what to say. We've had no other reports of this happening either. 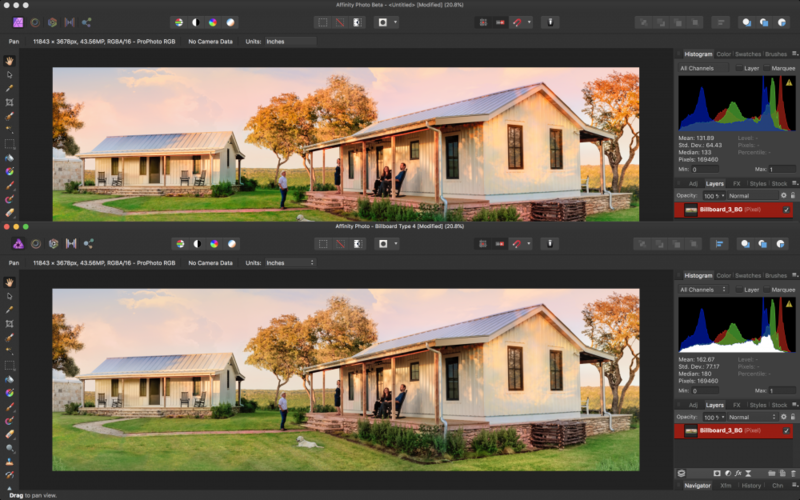 The only thing you could consider doing is a ctrl runup on both live and beta, set both to the same UI colour and ensure you're opening the exact same file with no adjustments/filters. I’m definitely opening up the same file. And the colorspace is the same. The UI is not an issue, as you can see from the screengrabs, the image is more saturated in APhBeta, its not an optical illusion. I will try the CTRL key on startup when i get back to my computer. Hi Ronny, a couple of things to try if you're up for it? 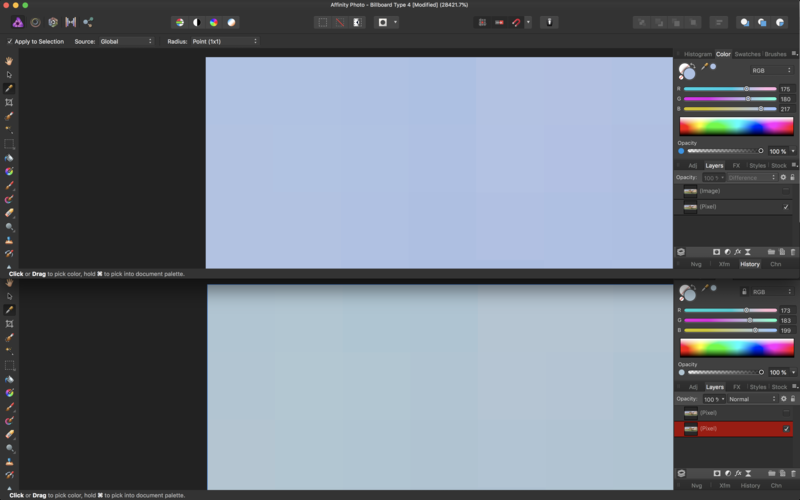 1) Could you copy/paste the pixel layer from one document to the other and see if the colours are rendered differently between the two images within one version of the app (hopefully that makes sense?). And maybe the other way around, so 1.6 to 1.7, and 1.7 to 1.6? 2) This is a bit trickier, but could you try colour picking the same value across both images as they're open in 1.6 and 1.7? Perhaps try a pixel in one of the corners? (Note: don't colour pick them as two separate layers within one version of the app, it's crucial that they are evaluated in separate versions). Reason being is that we should establish whether the actual colour values in the document are different, or whether it's a change in colour management and how the values are translated from document to monitor profile. We've loaded up the document you provided across both versions and produced screen grabs (ChrisB has attached the document with the Difference blend mode to illustrate this attempt) and we couldn't see any difference between the apps. Have you profiled your display at all using a colorimeter? Or are you using the default display provided with your internal MacBook panel (usually Color LCD) or external monitor? The only other thing I've noticed from your screen grab is that in 1.6 you've opened up what looks like the original document, whereas 1.7's window reads Untitled—have you copy/pasted the pixel layer into a new document from clipboard? When we did the testing, we duplicated the original .afphoto document (since the Affinity apps will not open a document if it's already being read by another app) and opened that, then deleted all additional layers just leaving the original Billboard pixel layer. Using this approach, we couldn't see a difference at all between the two app versions. The most illustrative tests would be the two I've listed above though, especially if you were able to colour pick a particular value. Maybe you could even resize the canvas to 1x1px for both documents to ensure you were colour picking consistently between the two? (A bit OTT and analytical, I admit, but probably the most accurate approach). Thanks and hope to hear back from you! Thanks James for the detailed instructions. I’ll try what you suggest when i have a chance and report back. Thanks for looking into it! Does it make any difference if hardware acceleration is disabled? I downloaded the latest beta 1.7.110 and inadvertently replaced the previous one with the issues. Nevertheless the issue is still present, although it's less worse than before. Enclosed are screengrabs again. As you can see, Beta is still rendering the colors hotter. Also notice the different values in the Histogram in each app. I Merged All layers on both Beta and MAS. Also I copied the file from MAS and placed it on Beta using Difference blend mode, and you can see the output is not pure black. Likewise I copied from Beta to MAS and got similar results, not pure black. @Justin, it makes no difference with Metal turned on or off. 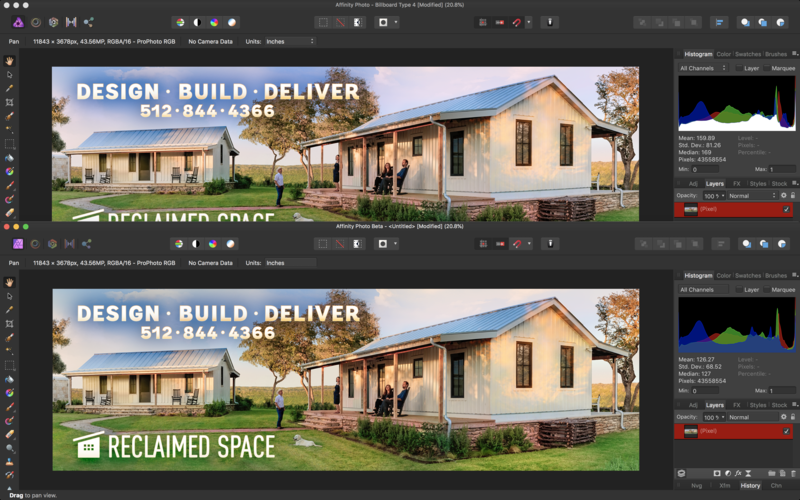 2) The last screengrab shows the difference in colors on screen and in the color picker. I made sure the Eyedropper tool was set to 1x1 in both MAS and Beta. I zoomed in the same exact percentage on both apps as well, although one window overlaps the other, so I was certain I clicked on the same upper left pixel on both. Color is definitely different. I have not changed the display profile. I'm using the default Color LCD supplied by macOS High Sierra (I'm not on Mojave). The APBeta document is the same as the one in AP MAS, but labeled Untitled because I elected to "Make a Copy" when opening the 1.6.1 file in Beta .110, so I can have it open on both beta and MAS versions. I hope this helps in your sleuthing. Let me know what else I can try...?